This recording consists of 10 tracks. Introduction by Debbie Bone. Vernon was born in Manchester, 13th May, 1930. He went to Oldenshaw Primary School. Describes his primary school years. Describes the desks, wooden in pairs with porcelain ink wells. Describes how naughty boys used to put carbide into the inkwells to make them froth up. Describes his teachers and headmaster whose name was Mr. Taylor and was known as Pop Tate. Describes a lady teacher who was married to a Frenchman who had a small beard and always wore a cummerbund. Remembers that there was a leather tannery next door to the school and the owner gave the school a field for the children to play on. Describes an item called a 'bingham pole' which was two blocks of wood in the ground and a telegraph pole was bolted horizontally on the top. Remembers that you could climb up on it and bounce up and down. Describes 'playing out' after school. Describes a brickyard behind their homes where the council stored paving slabs and kerb stones and they would play there. Remembers not wearing long trousers until he was 14 years old. Does not remember wearing school uniform. Describes 'playing in' when it was raining with train sets and Meccano. Describes a game of 'kick can' where the children chose someone to be 'it' and then one of the children would kick a can and 'it' had to go a retrieve it whilst the other children ran and hid. The child who was 'it' then had to find the children and make them captives. Meanwhile, whilst he was looking for the hidden children any one of them could come and kick and can again, thus freeing the captives and the person who was 'it' again had to retrieve the can and so the game went on. Also remembers there being a wood yard where some women worked breaking up wooden crates and the children would build dens with all the wood. Also remembers the night watchman making them swords out of bits of wood and making hand guards for the swords out of bits of car tyre. Remembers when he was a teenager that he was discouraged from playing with certain boys, one with the same surname of Rose believed to be Jewish and the other, Frankie Turner who lived the other side of the railway, and who was Irish, a Catholic, his mother smoked in the street and also his mother worked at the wood yard, breaking up crate and was thought to be 'common'. Describes his family as being upper working class. Describes his father going to work in a suit when he was promoted to overlooker and then eventually manager. Describes his father starting work at the mill as an apprentice, as did his grandfather. Describes how his father loved working at the mill and read many books on spinning and biographies of mill owners and inventors. Describes how his mother was from Lincolnshire and came to Manchester when she was about 15 and worked in the mill until she married his father. Remembers her as always wearing a long pinny and smelling of flour and lavender water. Remembers his father as always smelling of spinning oil and Park Drive cigarettes, he smoked 60 a day. Describes how he took an entrance exam for the grammar school at 11 and went on the local grammar in Oldenshaw which was not as good as Manchester Grammar, which he also could have gone to but as there was a war on and Manchester was being bombed heavily he went to the local school. The school was all boys as the girls went to the High School. Describes various teachers, John Lord the history teacher, Mr. Hutchinson an excellent English teacher who encouraged him to read novels by introducing him to H.G.Wells, the one book standing out in his memory being a short story called 'The New Accelerator'. Remembers really enjoying science fiction books. Remembers the maths teacher, cannot recall name, who made the lessons very entertaining but was very strict. Describes wearing a school uniform of short grey trousers until his was 14 then long trousers and wearing a royal blue blazer with silver buttons and a badge. Remembers the inscription over the entrance door ' Quit ye like men'. Describes taking the School Certificate exam at 15 and the Higher School Certificate at 16 when he left. Describes further teachers - the chemistry teacher as being a bit of a sadist and then remembers their being quite a few women teachers because the men were away at war. Describes antagonism between the french teacher, Mrs. Chamberlain and the maths teacher. Describes how his English teacher also encouraged him with his maths and geometry and he then describes how this came in handy when he was a scout. Describes joining the Scouts at 11 years old, his father was also a scout master, and having a staff with notches on it in feet and inches at the top and how he could, with the help of his geometry, measure the height of trees and the width of rivers and roads. Describes leaving school and going to art school at the Manchester Municipal College of Art. Describes the various lessons and then at 21 getting his National Diploma in Designs (which would be the equivalent of a degree today). Describes how he enjoyed doing sculpture and enjoyed every minute of being a student. Describes how his tutors were equals and how he used to meet up with them for drinks. Describes how he worked during the summer holidays to pay for materials and fees. Describes working on a trawler from Grimsby, and working on a farm and building sites. Describes leaving college and wondering about the country with a friend and a small tent. Describes going to London which was very exciting and also travelling to Land's End, stopping off at St. Ives. Remembers during the early 1950's going to the Festival of Britain and remembers the site of a giant tent standing out as there were not many tall buildings in London then. Remembers that his first wife had been at the Festival demonstrating rotary irons, but he did not know her then. Describes meeting various artists at St. Ives, the one really standing out being Sven Berlin and his wife Helga, describing them as being the ultimate bohemians. Describes how he did a lot of drawing then, not so much painting. Describes himself then as having long hair and a beard and wearing a ragged shirt and corduroy trousers (which only builders on building sites wore in those days). Remembers meeting Dylan and Caitlin Thomas in pubs and them being drunk a lot of the time. Describes living in St Ives for a whole summer with some of his fellow students in a disused pill box on the headland on the edge of the sea. Describes how they had a primus stove and met two girls who worked at a local hotel and would bring them food in catering size tins and how they made a chimney by cutting the tins and joining them together. Describes how they stayed there until the end of the summer and had to move as the public toilets they used to wash in were closed for the winter. Describes how he used to raise money by busking the harbour with his guitar. Describes before going to art school he had heard Burl Ives singing on a juke box and like the sound so he managed to buy a guitar from a second hand shop and taught himself. He liked to sing folk songs as these were the days prior to skiffle and rock. Describes how he came to London with a couple of friends and they lived as 'artists' in a 'garret' in Little Venice by the canal. Describes how on entering the Victorian house the stairs would be carpeted at first then only lino and then right at the top where they were just bare boards. No. 24B Clifton Gardens. Remembers the canal as being very dirty and the area very scruffy, not like today. Describes how he and his friends took it in turns to work to pay for the keep, one worked at a tyre depot, another as a photographer and he worked as a porter in Hamleys. Describes how they would go to lots of parties and head straight for the food, going past the drinks and good looking girls. Describes getting married to his first wife, Sheila, and going to live in Jersey. Describes working for Jersey Airlines, designing posters for advertising. Describes sharing a studio with some friends and also describes another friend in his 50's who had been in France in the war and helped with the French underground. Describes how this gentleman would work as a cabaret artist in the evening and would take his easel and some chalks and would ask the audience to call out the name of a famous person, and then he would sketch this person upside down and then spin it round. Continues describing the above artist and names him as Ron Cavell and he wore a blue smock and a very large velvet beret. Describes singing with Carl Denver, who was not American but Scottish coming from Glasgow. Describes them singing at the Grand Hotel and calling themselves 'Hill and Billy' and they sang cowboy songs. Describes working for a local builder carving out names and carving commemorative seats. Describes coming back to England for the winter and working as a porter in a store in Holborn. Describes singing at the Witches Cauldron on Haverstock Hill, Hampstead, where he lived. Also described a Spanish couple who also worked there singing and dancing. Described how he and his wife then moved to Brighton where he worked very hard singing and playing in a band and eventually having a complete physical and mental breakdown, which lasted for quite some time. Describes how they returned to St Ives and he got a job managing a caravan site and lived in a large trailer on the site. Describes how they then moved into a cottage in St Ives and he converted the cellar into a studio. Describes how you could also rent a studio for £1.00 per week. Describes moving to Suffolk in 1981, and painting miniatures which he had to stop as he lost his eyesight. Describes that when he was in St Ives he painted lots of portraits of people outside their homes and many buildings. Mentions such people as Pat Heron, Peter Langham, Terry Frost and Francis Bacon and of course his cousin Ben who was married to Barbara Hepworth. Remembers buying a painting from Wilhelmina Barnes Graham for 12 guineas. Mentions that he was married with two children. Describes an exhibition he is having in St. Ives this Summer with Tommy Shields. Describes how he met Jan, his second wife about 14/15 years ago and they have been married 10 years. Describes getting involved with a street theatre in Falmouth and running Punch and Judy shows. Describes how one of his friends had two small children and he made them a Punch and Judy and put on a show for them and it all went on from there. Describes how he was always really busy during the Summer putting on shows and had a pitch in Padstow. Describes how once a year he would bring his show to London for about one month at the Polka Theatre, Wimbledon and The Little Angle. Describes how all the Punch and Judy men would get together on the first Sunday in May at Covent Garden. Mentions that Punch and Judy was first mentioned by Samuel Pepys in his diary when SP and his wife were walking home and stopped by St. Paul's church in Covent Garden to watch a show. He thinks this would probably be around 1666'ish. Describes his painting studio in Falmouth and mentions that he would go to Southern Ireland every year in February, March and April touring with Punch and Judy and giving lectures on puppet theatre. Briefly touches on his depression and what he feels like. Describes meeting a man called Taffy Thomas and working with him on a street theatre group called the Magic Lantern. Remembers another time working with Taffy and calling themselves the Salami Brothers, mentions Lambretta Salami. Describes how they used to put on shows to raise money for the Lifeboat Institution by performing escapology in the harbour. He would be put in handcuffs and a sack and dropped into the harbour but would escape quite easily. Describes how they also used to do fire breathing and lying on a bed of nails. Describes how he came to Suffolk with Taffy Thomas on an Arts Council Project called Suitcase Circus. This was based at Campsea Ashe Youth Club and children were taught circus skills such as stilt walking, unicycling, juggling etc. They then went round to village halls, schools, old folks homes and public houses putting on circus shows. Describes how he got involved with Wonderful Beast at Aldeburgh School and singing sea shanties. Believes this was all to do with the school's Eastfeast festival and he describes how he burnt his old boat on the beach whilst singing sea shanties. Continues describing Eastfeast. Describes how last Summer he was asked to be in a play called The Dead Moon. Describes how Taffy had a stroke when he was 30 and had to have speech therapy and now travels the world as a professional storyteller. Mentions that when he separated from his first wife he let her have the house which was very large and had some bedsits in as he had no money to give her. Mentions that he also worked at the Art School in Falmouth part time. Describes how after he left his wife he lived mostly in trailers until he met Jan and they moved in together. Describes living in a trailer behind Leiston Police Station. Describes painting miniatures whilst living in trailers as there was not much room. Mentions that he used to exhibit them at Dennis Tapling Gallery in Woodbridge, although this is now a gift shop. 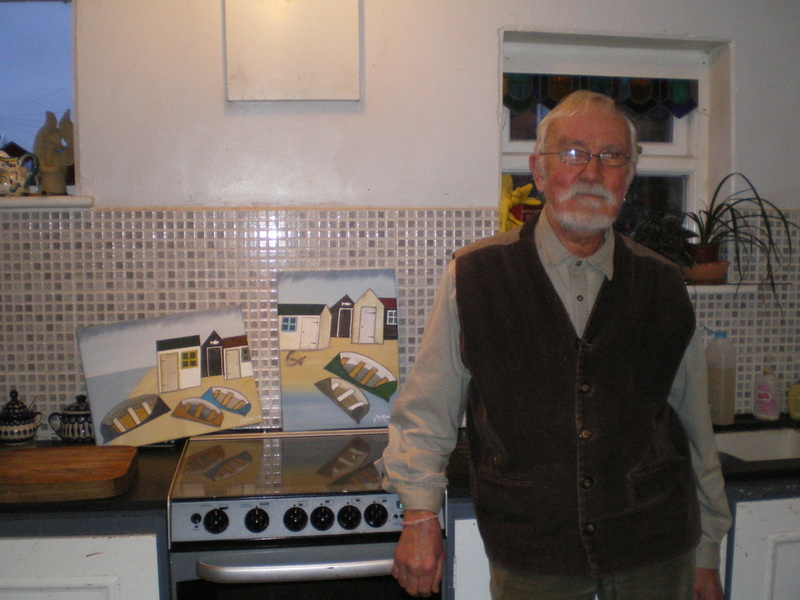 Describes how after his sight failed about four years ago he started to paint pictures that echoed his memories of Cornwall, and painted lots of harbour scenes and described these as being like enfolding arms and a safe place. Describes how he also tries to paint East Anglia scenes. The tapes then gets slightly distorted as he appears to be looking at various pictures with Debbie Bone and describing the colours he would use to paint East Anglia. Describes these as being white, cerulean blue, panes grey and ochre. Describes the 'big skies' in East Anglia. Describes why he paints lots of steps in his Cornish pictures. Mentions that he is writing a trilogy, one book about Cornwall, the middle book about Suffolk, called Sunrise Land and the last one about Ireland, called Old Men Smiling. Describes that these books are based on himself. Sings two songs, the first Parting Glass and the second Farewell Shanty.